Can VW’s new Uber Golf R cut it against Renault’s Megane 250 cup and Ford’s sharp-as Focus RS in the battle of the hyper hatches? Right, let's get this clear from the off: the three cars assembled here all deserve a category catch-all that transcends the mere ‘hot hatch’ tag. Call them uber-hatches, mega-hatches or whatever, but the Ford Focus RS, Renaultsport Megane 250 Cup and Volkswagen Golf R all take a big step up from their respective XR5 Turbo, non-Cup-chassis RS, and GTI brethren. In fact, to varying degrees, they do exactly what it says on the tin – shifting from a before-midnight soft-core film into, well, R-rated turn-on stuff. Not that you’d immediately group the three together from the way they look. The Focus RS is definitely the most aggressive-looking of the trio. From some angles it looks almost like a caricature of itself, a concept car that has somehow made it all the way to production without losing its liquorice-profile tyres or its bulging, wide wheelarches, complete with air vents to expel its latent energy. And yet in its own way the Renault, too, appears just as flamboyant, even if its overall personality is marginally less cartoonish, and therefore slightly more elegant than the Ford’s one-dimensional Superman approach. It’s the Golf, however, that looks the most surprising to begin with, because it would seem to be a complete misfit beside the other two. The changes over the regular GTI are subtle: a different front bumper with LED daytime running lights, side skirts, bigger 18in alloys, blackened door mirrors and, like the old R32, centrally-mounted dual exhausts. It seems all a bit Q-car, but that’s perhaps the effect VW’s designers were seeking to achieve. But the Ford, Renault and VW’s differences aren’t limited to exterior styling. While all three of these cars aim for broadly similar results, the ways in which they go about delivering mega-hatch performance couldn’t be more different. Over ’ere in Blighty, the Renaultsport is the cheapest by some margin and the VW the most expensive. When the RS 250 and Golf R land in Oz later this year, their price tags should read $47K and $55K, respectively. Too bad you won’t be getting the Focus RS, which slots between the two on price. There are fairly obvious reasons why the Golf is the most expensive. One, it’s all-wheel drive whereas the Ford and Renault are front-drive. Two, it’s a VW, which is a much harder commodity to put a price on. Although there is undeniably an element of extra value contained within the VW brand, Ford and Renault, alternatively, might argue that, in this case, the sporting pedigree of the RS and Renaultsport brands are more than enough to offset the VW’s reputation for quality. Yet when it comes to the amount of firepower they each pack, the Golf doesn’t appear to provide much compensation. In simple terms, the Golf’s 2.0-litre turbo four serves up 199kW at 6000rpm and 349Nm at 2500rpm, enough for a claimed 5.7sec 0-100km/h. By contrast, the Renault’s 2.0-litre turbo engine produces a similar 184kW and 340Nm, sufficient for a claimed 6.1sec 0-100km/h sprint. The big hitter of the group, however, is the Ford, whose 2.5-litre turbo five cylinder thumps out 224kW and 439Nm. So even though the RS is the heaviest of the trio (just), it’s also the brawniest on paper by quite some margin, once the obvious advantage of the Golf’s AWD system has faded and they are up and running. On the road, in fact, the Golf initially feels comprehensively outclassed by the others for pure acceleration. You’d expect as much relative to the Ford which is an absolute monster in a straight line, but in reality the Renault also feels much more urgent than the VW. How so? Two reasons. One, the Renault’s gearing is closer and simply better suited where it counts, allowing it to breeze away from the lazier, longer-geared VW at the merest whiff of throttle in the intermediate ratios. Two, our test Megane felt lively compared with the version we drove on the launch late last year. And compared with the test VW, which had a triple-digit odometer reading, its engine was well and truly run-in. These two elements meant that the Megane could drop the VW without trying very hard at all. In fact, we discovered that for raw acceleration it was quick enough to get much closer to the mighty Focus than we were expecting. But we’re getting ahead of ourselves here. What’s more important than any power war is how these cars differ from one another on the road. Not just in a straight line but over poor surfaces, through corners, ambling along freeways and sitting in traffic jams. And the truth is, the more regular the situation, the more sense the Golf R tends to make. The moment you climb inside the VW, you become aware that it’s not even trying to emulate cars like the Focus RS and Megane 250. Yes, the driver’s seat is nice and supportive and, yes, there are hints of sporting intent in the thickness and shape of the flat-bottomed steering wheel. But the overwhelming impression inside the Golf R is that of a high quality, not-especially-thrusting kind of car. And when you turn the key and the engine fires, it doesn’t announce itself to the world with a blast of revs, or a dramatic bark from the exhaust. It just starts, then settles to a refined, slightly bassy, heavy idle, a subtle indication that a reasonable degree of potency is present, but nothing more. In the Ford, part of you feels you should be revving the engine like an adrenaline-wired teenager when you fire it up, just so you can hear that five-cylinder warble. The difference between the character of these two cars becomes that obvious, that quickly. Until you move away, at which point the gap grows wider still. Instantly, the Golf R has a much smoother, better ride than the Focus RS, and its smaller tyres also generate less road rumble than those of the Ford. Same goes for the Renault; its ride is calmer than the Ford’s, though nowhere near as soothing as the VW’s. Less impressive is the way the Golf R feels Passat-like in its demeanour, rather than super-fast Golf. This is in complete contrast to the Renault – which has a short, sharp, rifle-bolt-precise gearchange – and the Focus RS, which is somewhere between the two. The Golf R’s chassis is harder to sort or improve via the options list, although you can specify Adaptive Chassis Control (ACC) to apply three different damping stages: comfort, normal and sport. The test car was so equipped, and having played with the various settings we’d say it’s an option you could probably go without. It doesn’t deliver anything like the dynamics available in the Ford and Renault, at any rate. Instead, the R is entirely predictable and extremely mature in the way it handles, but also just a touch on the ordinary side. Which is fairly odd considering how much more incisive the Scirocco R is on the road, which is front-, not four-wheel drive. Even with the ACC system set to sport, there is little true crispness to the way the Golf behaves, again quite unlike its Scirocco stablemate. It turns- in okay, it has huge traction and its body control is perfectly acceptable. Even when you drive it as hard as you can, this car does absolutely nothing you don’t expect it to do. But neither does it amaze, thrill or excite with the way it changes direction, or turns-in to high-speed sweepers – not like the Ford does pretty much every time you aim it at a corner. VW reckons that, at times, the upgraded 4-Motion all-wheel drive system can deliver 100 percent of its drive through the rear axle, but in reality no matter how you drive it, the Golf R always behaves like a front-drive car that has lots of traction. The sort of people who would naturally gravitate towards the Ford and Renault will find the Golf R oddly bland as a driving experience. As you may already have twigged, the Ford and Renault are singing from an entirely different, more exciting hymn sheet. So-called RevoKnuckle front axle or not, the Focus RS torque-steers, but the overall experience is well judged for road driving; it is exhilarating, confidence-inspiring and fun without ever becoming intimidating. And that firm urban ride translates into body control that is absolutely first-rate when the roads get really rough at speed. Generally, the Megane is impressively free from torque-steer, but first impressions suggest it isn’t as savage (read ‘fun’) as the Ford. 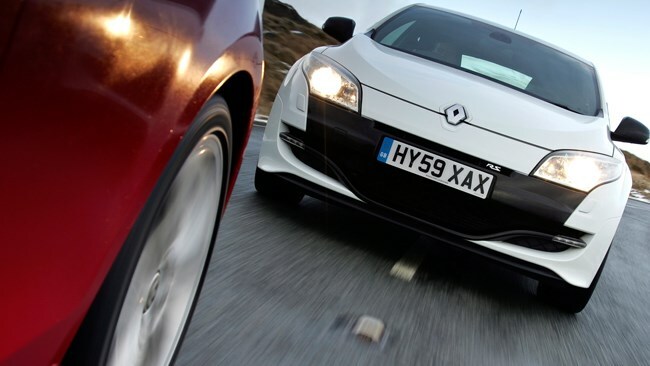 However, the longer you spend with the Megane 250, the more you appreciate just how quickly it can cover ground. In fact, by focusing on control and precision rather than the Ford’s playfulness, it is the Renault that delivers more grip and agility (and the faster dry lap time). So with the VW out of contention, which is the better car overall out of the playful Ford and precise Renault? Well, be in no doubt that when the time comes and that great road opens out before you, the Focus RS still delivers the biggest thump of adrenaline. It remains the supreme being among mega/uber/R-rated hatchbacks when it comes to pure thrills, so, despite the Renault’s price advantage, the Ford has a rawness that is near-impossible to put a price on. It may even be priceless, in fact, which makes its absence in Oz even more lamentable and leaves the Megane 250 Cup virtually in a class of its own.